Stripes are always classic, and patterns that play with stripe placement are a perennial favorite. With striped knits, it's easy to get tons of interesting effects just by re-arranging your pattern pieces! Cut a few pieces on the cross grain, or on the bias, for high-impact stripe collisions! We have lots of striped knits in the store right now. Here are just a few! Earlier this week, we showed you some new cotton lawn and shirting. Here are a few more luscious fabrics from our new arrivals, in lightweight silk or rayon challis. Soft, drapey fabrics like these are very flattering to wear! Try them in blouses, dresses, and full skirts. We have a huge new shipment of fabrics from one of our favorite design companies, Cotton and Steel. First up let's take a look at these linen/cotton blend prints. Their heavier weight makes them ideal for home sewing, bags, and crafts. Or try simple, unstructured garments like short, straight skirts or boxy jackets. Next up, we'll be sharing some cotton prints and delightful rayon challis from Cotton and Steel! We have shelves bursting with new arrivals for spring! Take a look at these new cotton lawns and shirtings. Plaids like these are crisp and fresh! A watercolor-look print takes classic Swiss dot from charming to bold. Have you started your spring sewing? 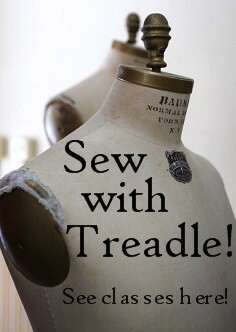 This ones turns an 18th century cutting diagram and fashion illustration into a scary sewing pun! And take a look at this amazing unicorn print. Plenty of detail in the flowers and fairies! Panels are perfect for quilts, wall hangings, or any project that requires a large allover pattern. We have a two new jackets on display made in Lana Bolito, a fabulous felted wool and rayon blend. Soft, springy, with edges that don't fray, this fabric is gorgeous and easy to sew! The purple jacket was made from the ever-popular Tremont Jacket pattern from independent design company The Sewing Workshop. This yellow jacket was made from Butterick 6140, a pattern designed for a soft felted wool fabric. Both jackets are unlined with edges left raw. Simple sewing at its best! Lana Bolito is great for indoor wear in winter and easily moves to outerwear in the transition to spring. All these great colors are selling fast, so come get yours today! We have some very unique new fabric pieces in the store right now: two hand-dyed lengths of African mudcloth, made in Bamako, Mali. This 100% cotton fabric was handwoven, then hand-dyed using only natural earth dyes. The narrow strips are then seamed together to make a whole cloth. Called "bogolanfini" in the Bambara language, each piece of mudcloth is unique. The heavier weight and bold designs would make these fabrics great for home sewing like throw pillows or bags. Boxy jackets and vests would also look great! Okay, you know we love Japanese fabrics at Treadle. Here are a few more wonderful new prints on heavier cotton and cotton/linen blends, including a couple that are becoming our new favorites! There is so much detail in this print. The more you look, the more you find! Stop by and take a look at all our great imports! We have some new cotton jersey knits in the store. These knits have a thicker, heavier weight than most jerseys, perfect for that thicker tee or dress for winter-to-spring layering. These 100% cotton knits are extra wide too - well over 60 inches! We have some new batik prints with a modern feel. These resist-prints are fresh and bright, with just one or two colors, a departure from the sometimes muddy, multicolored look of traditional batik prints.